Preheat an oven to 350 degrees F (175 degrees C). Grease a large casserole dish. Heat the vegetable oil in a skillet over medium heat; cook the onion in the hot oil until softened, 5 to 7 minutes. Mix the cooked onions, tater tots, mushroom soup, sour cream, butter, pepper, and salt together in a large bowl until the tater tots are evenly coated. Stir the Cheddar cheese in a little bit at a time until evenly distributed throughout the mixture; pour into the prepared dish. Sprinkle the potato chips over the top. Bake until golden brown on top, 45 to 60 minutes. 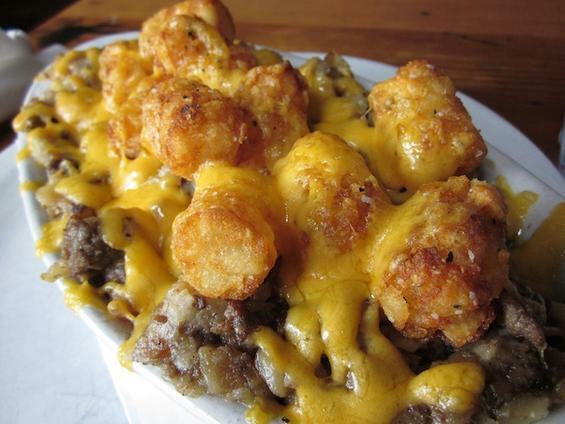 No comments for: "Yummy Tater Tot Casserole Recipe"